SendToX (previously called 7toX) brings your Premiere Pro or Final Cut Pro 7 or 6 XML into Final Cut Pro X so you can use Apple’s powerful new professional editing tools to update or finish your older projects. The lightweight application is simple to use, with drag-and-drop support and progress information. SendToX translates important metadata from your Project XML — including bins, clips, subclips and sequences — to a new Event in Final Cut Pro X with the highest fidelity of any translation application for Final Cut Pro. In addition, the application provides clear, detailed reporting after every translation. IMPORTANT: Final Cut Pro 7 will not run on macOS High Sierra 10.13 or later! SendToX displays a progress bar during XML translation and, when completed, adds the new Event to the Event Library. The Event contains clips for each media file and Compound Clips for each sequence. 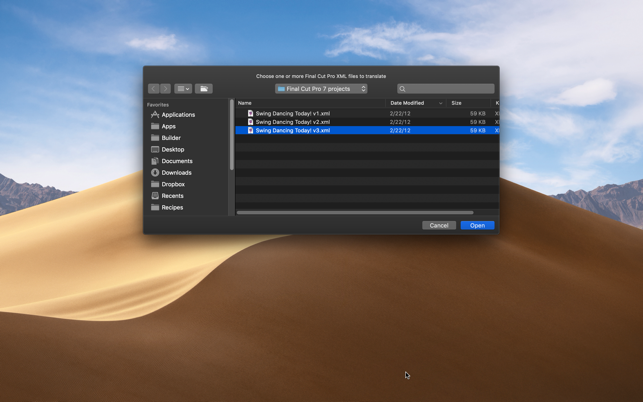 SendToX supports both Final Cut Pro X and the Final Cut Pro X Trial. SendToX adds red to-do markers to items that have been changed or substituted during translation. You can easily view these markers in the Timeline Index in Final Cut Pro X, and quickly jump to a specific marker to review any change in context in the timeline. • Does it work with .fcp project files? - The Final Cut Pro project file is a binary format proprietary to Apple. The XML must be exported from FCP 6 or 7. • Does it work with Final Cut Pro 6 or 5? - User testing shows that SendToX does work with XML from FCP 6 and 5. We have a concern with speed changes as that changed with version 7. • Does it work with Final Cut Express? - Unfortunately Final Cut Express does not export XML, which is what SendToX translates. It is possible, if you have an accommodating friend, to import your project (with media) into Final Cut Pro and then export Final Cut Pro 7 (or 6) XML. So happy with this purchase! 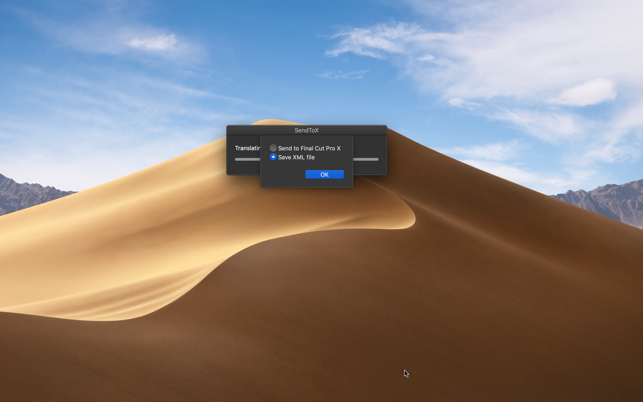 SendToX did exactly what I needed it to do, taking the XML from Premiere Pro CC 2019 and sending it into FCPX 10.4.4 and giving me the exact replica of the sequence with clips and all. Talking with the good folks at Intelligent Assistance was also rewarding. I would highly recommend the app. This app requires you to have a running version of FCP 7 to export xml files. This application is an excellent and necessary addition for anyone who has been editing in FCP 7 and wants or needs to transfer a sequence to FCP X. I have read some of the reviews and I think people have been a little harsh on this program. Yes, some things don't translate perfectly but when translating/transferring something this drastically different as far as workflow is concerned I think it does the job. I needed it for a project I was working on for a client that I started in FCP X but they had an early cut they had done in FCExpress. I opened their older project in FCP 7.0.3 (again, I think they may have edited in FCExpress) I relinked the media, exported the XML, opened 7toX for Final Cut Pro, it asked me if I wanted to open it in FCP X and boom! I had this multilayered timeline in FCP X from FCP 7. Excellent! For me, I come from the days of dealing with all kinds of post issues (anyone remember matchback-editing 24fps on a 30fps system with no other option?) The few incorrect elements that occurred (text alignment and size, mainly) were minute. This extremely affordable application has given us something that Apple should have done in the first place - the ability to transfer an FCP7 timeline into FCPX. And I'm certain this application will continue to be developed and consistent as FCPX gets better.